This article was originally posted on crainscleveland.com by Crain Content Studio. 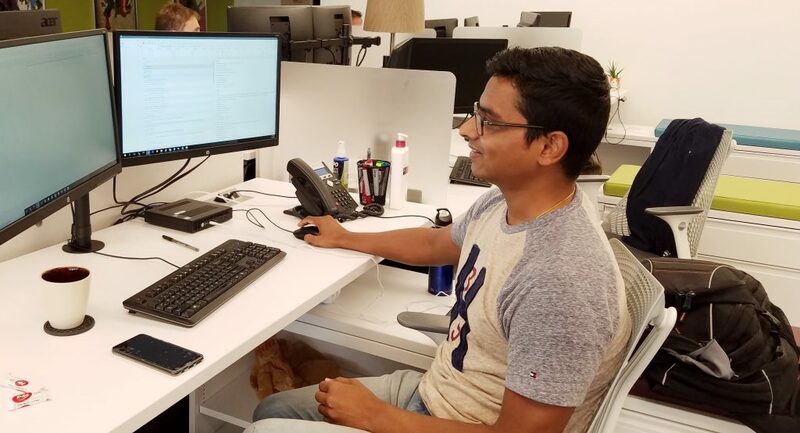 Ramesh Kanjinghat is a lead software engineer at Cleveland-based FormFire who oversees the efforts of the development group, mentors team members and architects and develops new feature functionalities. While software engineers continue to be one of the most in-demand positions within the technology field, the industry is also experiencing an increased need for customer-facing IT positions, creating more pathways into the field. For every dollar spent on a coding position, there is a two-fold spend on customer-interfacing jobs at Cleveland-based FormFire. The positions range from product strategist, IT operations and user interface designer, to the newer and increasingly relevant role of the customer success associate. The combination of technical expertise and client communication skills are essential for employees engaging with brokers, employers and those who use the health insurance benefits platform. “You often hear, ‘it’s all about the code, silly.’ But it’s not all about the code when you have customers. When you’re interpreting a product to customers, there’s a lot more customer support required than you would think, particularly when the software is part of a solution,” said managing partner Colin Ingram. The cross-section of infrastructure expertise and product knowledge illustrate the increasing range of job opportunities and skills needs in demand at companies such as FormFire and in the technology field in general. The evolution and sophistication of careers in technology mean that companies are getting more creative with recruiting and nurturing talent, a strategy that is essential in a growing sector that faces a persistent local talent crunch. In Northeast Ohio, the number of filled jobs in computer IT increased 30.1% between 2010-19, which was on par with the national average of 30.8% and above the state increase of 28.6%. The most notable occupational increases included information security analysts (+86%), applications software developers (+78%), web developers and computer user support specialists (both +42%). The only employment declines were computer programmers (-33%) and systems software developers (-6%). SOURCE: EMSI. Data were analyzed for Carroll, Cuyahoga, Geauga, Lake, Lorain, Medina, Portage, Stark and Summit counties. At Richfield-based OEC, the profile of employees who have a solid understanding of the product and business side of tech includes business intelligence engineers, quality assurance specialists, product managers, product owners, scrum masters, and user experience and user interface designers, said Amy Jacko, senior recruiter. In 2017, Ohio’s technology industry cluster’s average annual pay was $84,922, which was 75% higher than the statewide private industry average annual wage of $48,577. “Five or six years ago, we didn’t even have a UX or UI business intelligence team,” she said. “We have a lot of openings in business intelligence,” which reflect the combination of strategy and tools needed to drive actionable insight into the needs of their customers. OEC, which provides software to automotive and truck dealerships that facilitates the sale of original equipment parts, employs about 330 individuals in the U.S. and 1,000 worldwide. The company has been intentional about its recruitment efforts, working closely with local high schools and higher education institutions such as Baldwin Wallace University, as well as local coding boot camps to help infill the breadth of IT talent that represents 45% of its overall workforce. OEC’s eight-month internship program also has been valuable in supplanting IT talent need. Last year, OEC hired 50% of its interns into full-time positions, an increase over the previous year when the company hired 40%. The evolving technology landscape and spawn of new technical and customer-facing positions also has impacted the types of qualities OEC looks for in potential recruits.